WAILUKU, Maui, HI – (April 3, 2018) – This week, the County of Maui Mayor’s Office of Economic Development (OED) and the Maui Chamber of Commerce released a full report detailing the results and economic impact of the 4th Annual Made In Maui County Festival (MIMCF), which was held on Nov. 3-4, 2017 at the Maui Arts & Cultural Center in Kahului, Maui. The 2017 Made in Maui County Festival drew over 10,000 of residents and visitors to the Maui Arts & Cultural Center on November 3 and 4. 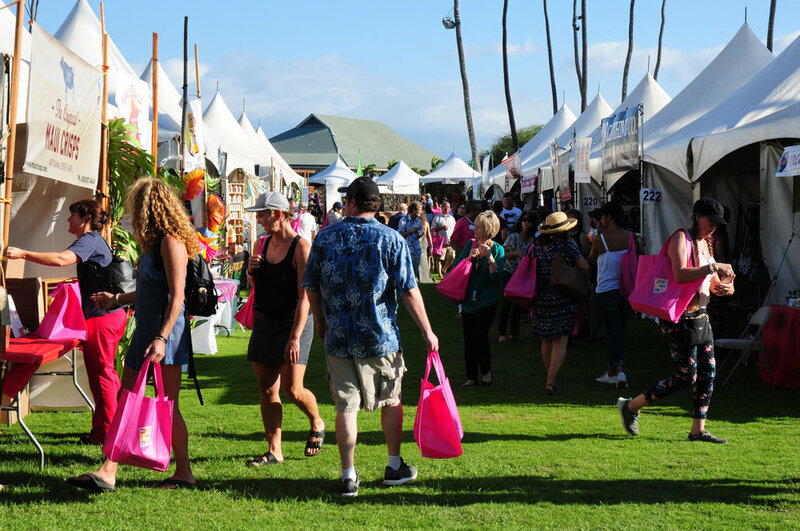 Presented by the County of Maui Mayor’s Office of Economic Development (OED) and the Maui Chamber of Commerce, the MIMCF is Maui County’s largest products show. Last year, over 140 vendors, including 17 companies from Molokai and 7 from Lanai participated in this two-day event – a veritable showcase of Made-in-Maui-County products. In addition, 16 food trucks also presented a diverse menu of island cuisine in the event’s Food Court. The annual MIMCF was created to improve the islands’ economic well-being by helping to grow and sustain Maui County’s manufacturers in an effort to diversify the economy, showcase entrepreneurship and locally made products, and encourage job creation. Over $1.8 million on retail sales. Over 980 new wholesale accounts secured. Over 6,290 new leads established. Over 10,000 visitors and residents attended the festival in 2017. - Over in $572,963.56 total product sales. (Compared to $512,922 in 2016, $416,000 in 2015, and $300,000 in 2014). - Over 217 total new wholesale accounts/orders were closed. - Over 703 new wholesale leads and/or prospects were developed. - A total of 550 qualified wholesale buyers and distributors attended a special invitation-only Buyers Preview on Friday, Nov. 3. Vital to vendors’ success and the event’s overall economic impact is the “Buyers Preview,” a B2B event where prequalified wholesale buyers and distributors receive complimentary festival admission to meet with vendors and find new locally made products. In 2017, over 550 wholesale buyers and distributors across the state and as far away as Canada attended, which was a 65 percent increase over last year’s Buyers Preview attendance. Made in Maui County Festival organizers met with participating vendors for last minute announcements before gates opened on Friday, November 3. In addition to providing MIMCF vendors with a world-class venue to showcase their products and opportunities to connect with wholesalers and distributors, the event’s organizers also offer these businesses a number of entrepreneurial resources and support year-round. Help Maui County businesses grow which creates many public benefits, including: new jobs, additional tax revenue, and product diversity. Expose Maui County manufacturing businesses to wholesale buyers, and distributors worldwide to help them expand beyond Maui County to statewide, national and international markets. Showcase high quality locally made products that have 51% of their value added in Hawaii, and their companies headquartered in Maui County, which promotes local entrepreneurship and opportunities for investment. Leverage Maui County’s robust visitor industry by creating a quality destination event that is marketed worldwide. Encourage sustainable growth by promoting “shop Maui County first” to residents and visitors worldwide and providing avenues to accomplish this year-round. Rebecca Woodburn-Rist of Haleakala Creamery shared “My family has been working on our business for the last four years, slowly building our herd of goats and taste testing a lot of products. This festival gave us an opportunity to share our products’ flavors with as many people as possible in a short amount of time.” Pictured: Rebecca with Violet (her family’s resident goat). Maui County-based businesses interested in participating in this year’s festival, can download an application at www.MadeInMauiCountyFestival.com/vendors (for product vendors) or www.MadeInMauiCountyFestival.com/food-trucks (for food trucks). Deadline for applications is May 31, 2018. A variety of sponsorship opportunities are available for companies and organizations interested in promoting their goods and/or services and who want to promote their support of local businesses. Download a Sponsorship Kit at www.MadeInMauiCountyFestival.com/sponsors. Qualified wholesale buyers/distributors may receive complimentary admission to attend a special “Buyer’s Preview” on Friday, November 2. To register, visit www.MadeInMauiCountyFestival.com/preview. For more information, visit www.MadeInMauiCountyFestival.com, email info@MadeInMauiCountyFestival.com or call (808) 270-7710. Connect with the festival on Facebook, Twitter (#MIMCF2018), Instagram and Pinterest. February 14, 2018 Linn Nishikawa & Associates, Inc. In 2017, the Made in Maui County Festival drew more than 10,000 residents and visitors for two days of shopping at the Maui Arts & Cultural Center. This week, County of Maui Mayor’s Office of Economic Development and the Maui Chamber of Commerce announced that Product Vendors and Food Trucks applications are now available for their 5th Annual Made in Maui County Festival. Considered Maui County’s largest products show, the festival will be held at the Maui Arts & Cultural Center in Kahului and will be open to the public on Friday, November 2, 1:30 pm to 6 pm; and Saturday, November 3, 2018, 8 am to 4:30 pm. To download a vendor application, visit click here. Deadline for applications is May 31, 2018, by 4:30 pm (HST). Businesses will be notified of the Vendor Selection Committee’s decision on or before July 13, 2018. All products offered for sale must be 51% value added in the state of Hawaii. Applications are also available for local Food Trucks interested in participating. Last year’s festival attracted more than 10,000 residents and visitors. Over 140 product vendors participated, including 17 companies from Molokai and 7 from Lanai. A total of 16 food trucks also presented a diverse menu of island cuisine in the event’s Food Court. Sponsorship opportunities are available for companies wishing to show their support for Maui County’s entrepreneurs and their products while increasing visibility for their own business. Sponsor benefits include event promotions, event tickets, program advertising and more. The festival is presented by the County of Maui Mayor’s Office of Economic Development and the Maui Chamber of Commerce. For event information, visit www.MadeInMauiCountyFestival.com, email info@MadeInMauiCountyFestival.com or call (808) 270-7710. Thousands of residents and visitors came out to shop and support the over 140 vendors offering hundreds locally made products during this year’s Made in Maui County Festival held at the Maui Arts & Cultural Center on Nov. 3 & 4. As soon as the gates opened on Saturday, many shoppers made a beeline to the Kanemitsu Bakery tent. Despite bringing in their famous bread from Molokai in two planes the bakery still sold out. This week’s 4th annual Made in Maui County Festival held Nov. 3 & 4 drew thousands of visitors and residents to the Maui Arts & Cultural Center (MACC) reaffirming once again that Maui County is no ka oi (the best) when it comes to locally made products. 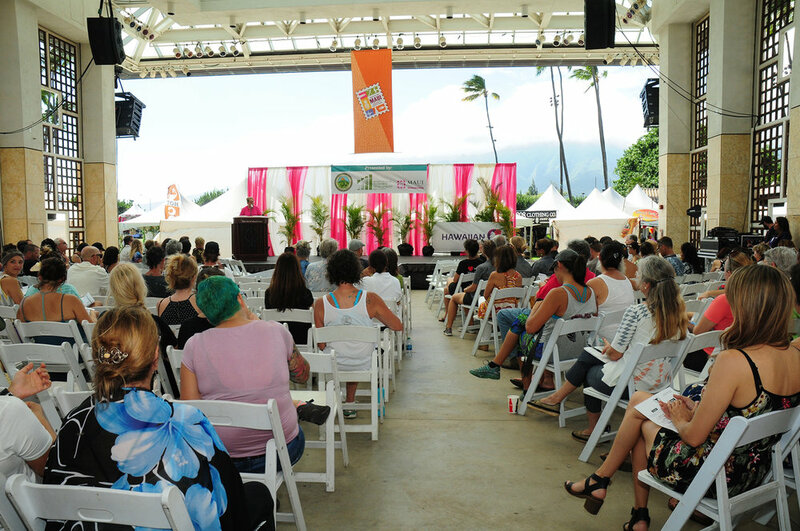 Event presenters, the County of Maui Mayor’s Office of Economic Development (OED) and the Maui Chamber of Commerce, reported another great year with a total of over 10,000 attendees over the two-day event. The Buyers Preview was one of the highlights of the festival with over 550 registered wholesale buyers and distributors across the state and as far away as Canada, which was a 65 percent increase over last year’s Buyers Preview attendance. 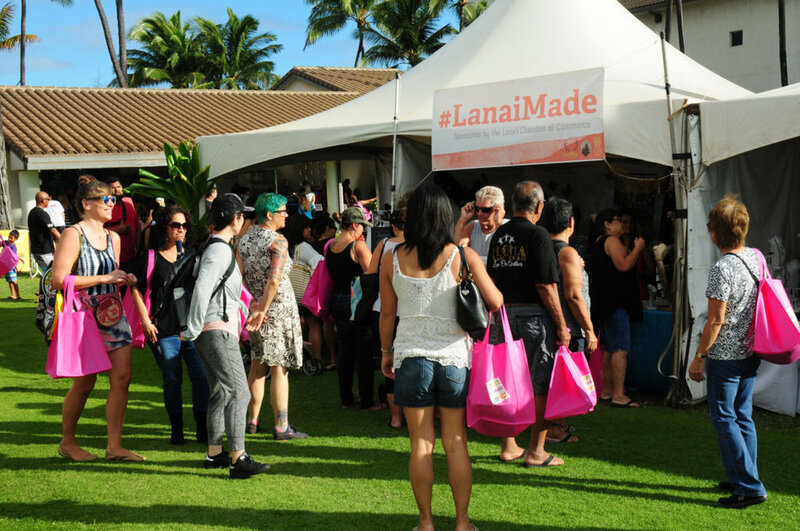 Those who attended enjoyed shopping over 140 product vendors from the islands of Maui, Molokai and Lanai offering hundreds of locally made products, island cuisine from 16 Maui food trucks, product demos, fashion shows and lots of aloha for Maui Nui. Vital to vendors’ success and the event’s overall economic impact is the “Buyers Preview,” a B2B event held on the festival’s first day. “The Made in Maui County Festival has allowed Molokai’s entrepreneurs to grow, shine and expand in ways that we could never do completely on our own,” said Michelle Naeole of Pacifica Hawaii Salt. Mill House Roasting Company captured the festival’s 2017 Mayor’s Booth Contest Award, Best in Show. Pictured: Pamela Tumpap (Maui Chamber of Commerce), Teena Rasmussen (Mayor’s Office of Economic Development), Keturah Schmidt (Mill House Roasting Company), Mayor Alan Arakawa. “The festival has helped us grow as a business by providing opportunities to network with other small businesses and pushing us to wholesale beyond Molokai,” said Eloise Jackson owner of Po`oHala from Molokai. According to co-owners Chap Chapman and Kristen Eggert, the festival has really been big for their business, Bow Addo, Inc., which they started 8 months ago. During the Buyers Preview, they offered wholesale for the first time for their eye-catching pet bow ties and bandanas. In addition to providing a world-venue to showcase their products in November, the festival also offers a number of resources and support to participating vendors year-round. These efforts include one-on-one assistance ranging from marketing support, branding, inventory control, cost and pricing analysis, and wholesale readiness. The Mayor’s Office of Economic Development also brings together a number of valued business development partners to offer these companies a wealth of programs, grants, consulting, and workshops to further their success. This in turn, has helped increase the capacity, knowledge, and skills for these small manufacturers helping to position them for success. A new online shopping resource called the “Made in Maui County Marketplace” – www.MadeInMauiCounty.com – also provides festival vendors with an opportunity to showcase their locally made products and to connect with prospective buyers and wholesaler buyers year-round. Lanai Chamber of Commerce showcased products from Cory Labang Studio, Honey Love, Anuenue Juice Truck, Phillip Sowers Photography, The Lanai Art Center and Two Boldly Go Photography. Got Goat Milk? 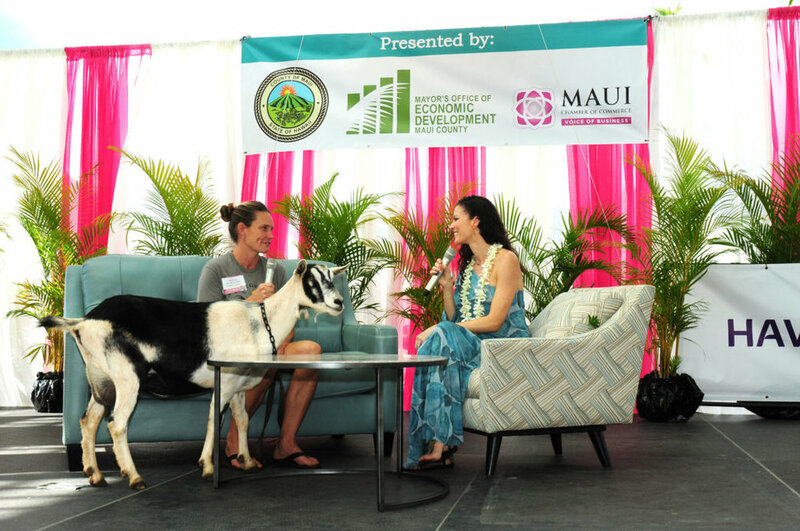 Rebecca Woodburn-Rist, Owner of Haleakala Creamery talked story about her farm and her goatlato ice cream and goat’s milk caramel sauces with festival MC Malika Dudley on the Hawaiian Airlines Event Stage in the MACC’s Yokouchi Pavilion on Saturday. The farm’s resident goat Violet also joined in the conversation. The 2017 Festival is sponsored by: Hawaiian Airlines; Pasha Hawaii; HAWAI`I Magazine; Maui No Ka Oi Magazine; Pacific Media Group; The Maui News; Paradise Television Network; HTDC Innovate Hawaii; KAOI Radio Group; Alexander & Baldwin, Inc.; American Savings Bank; HawaiiUSA Federal Credit Union; HHawaii Media; Bank of Hawaii; First Hawaiian Bank; Maui Electric Company; Maui Hotel & Lodging Association; Maui Printing Company; State of Hawaii Department of Business, Economic Development & Tourism; Goodfellow Bros. Inc.; Richard Kehoe CPA; Lloyd’s Kahului Chevron; Na Koa Brand; Queen Ka`ahumanu Center; Roberts Hawaii; and Maui Tropical Plantation. For more information on the Made in Maui County Festival, visit the event’s official website at www.MadeInMauiCountyFestival.com. 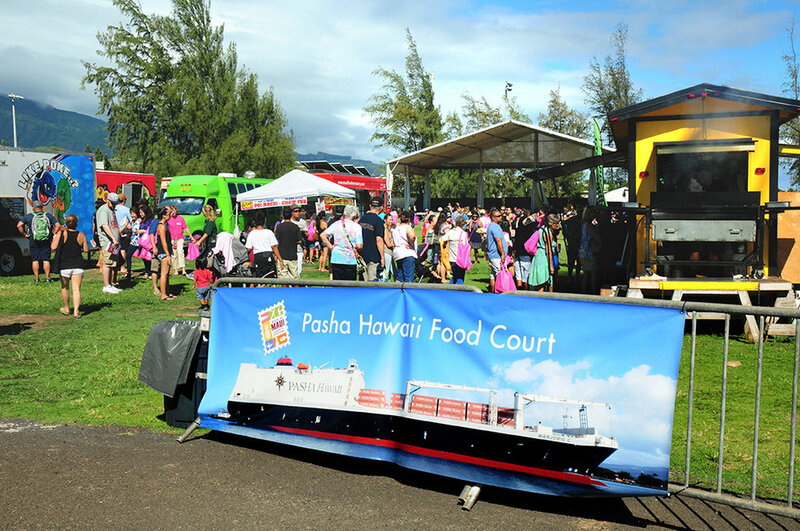 This year’s Pasha Hawaii Food Court featured 16 food trucks and a myriad of mouthwatering menus. September 27, 2017 Linn Nishikawa & Associates, Inc.
WASHINGTON, DC – The County of Maui Mayor’s Office of Economic Development won a Gold Excellence in Economic Development Award for its 2017 Made in Maui County Festival, a project in the category of Special Event of the International Economic Development Council (IEDC). The honor was presented at an awards ceremony on Tuesday, Sept. 19, during the IEDC Annual Conference, which was held Sept. 17-20, in Toronto, Ontario, Canada. “The IEDC awards process is a thorough, non-biased and multi-layered process. These are extraordinary accomplishments for all winners, and an overall great effort by all participants. We look forward to next year’s awards competition,” Langley said. The Made in Maui County Festival was established in 2014 by the County of Maui Mayor’s Office of Economic Development (OED) and the Maui Chamber of Commerce. Held each year at the Maui Arts & Cultural Center on Maui, this major event was created to help grow the islands’ value-added and small manufacturing businesses based within the county’s three islands of Maui, Molokai and Lanai. Prior to the festival, the official Made In Maui brand program had only 60 participating companies. In just 4 years, the festival has helped build that number to over 260. Being a juried show, the festival is the most sought-after products show on Maui, with the promise of unveiling new products, meeting with prospective wholesalers and distributors, and connecting with new customers. A dynamic entrepreneurial ecosystem has been developed around the festival, with 14 business development partners offering a wealth of programs, grants, consulting, micro-loans and workshops to further the success of these companies. Even those companies who do not get selected to showcase their products are offered a free 1-hour business consult. A Made in Maui County Marketplace website (www.madeinmauicounty.com) was also created to help festival vendors connect with consumers and wholesale buyers year-round. About the International Economic Development Council: The International Economic Development Council (IEDC) is a non-profit membership organization serving economic developers. With more than 5,000 members, IEDC is the largest organization of its kind. Economic developers promote economic well-being and quality of life for their communities, by creating, retaining and expanding jobs that facilitate growth, enhance wealth and provide a stable tax base. From public to private, rural to urban, and local to international, IEDC’s members are engaged in the full range of economic development experience. Given the breadth of economic development work, our members are employed in a wide variety of settings including local, state, provincial and federal governments, public-private partnerships, chambers of commerce, universities and a variety of other institutions. Among many activities which benefit the economy, IEDC’s members create high-quality jobs and develop vibrant communities. www.iedcONLINE.org.